The following steps are recommendation how to protect your router. We strongly suggest to keep default firewall, it can be patched by other rules that fullfils your setup requirements. Other tweaks and configuration options to harden your router's security are described later. Start by upgrading your RouterOS version. Some older releases have had certain weaknesses or vulnerabilities, that have been fixed. Keep your device up to date, to be sure it is secure. Click "check for updates" in Winbox or Webfig, to upgrade. We suggest you to follow announcements on our security announcement blog to be informed about any new security issues. Change default username admin to different name, custom name helps to protect access to your rotuer, if anybody got direct access to your router. Warning: Use secure password and different name for your router's username. We strongly suggest to use second method or Winbox interface to apply new password for your router, just to keep it safe from other unauthorised access. x.x.x.x/yy - your IP or network subnet that is allowed to access your router. 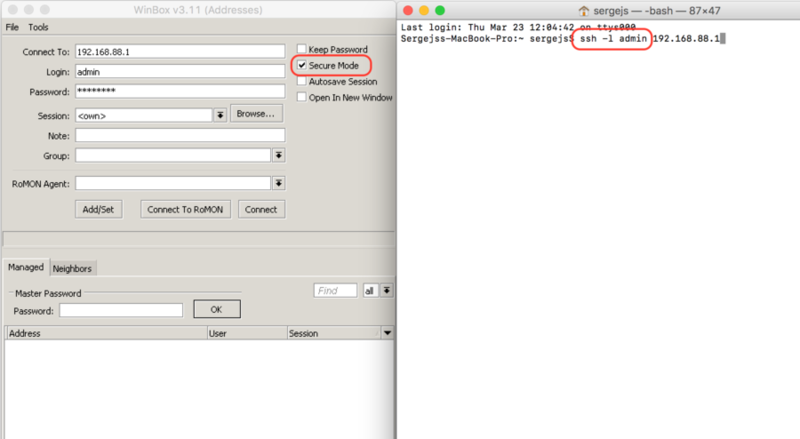 Note: login to router with new credentials to check that username/password are working. All production routers have to be administred by SSH, secured Winbox or HTTPs services. Use the latest Winbox version for secure access. Note, that in newest Winbox versions, "Secure mode" is ON by default, and can't be turned off anymore. RouterOS has built-in options for easy management access to network devices. The particular services should be shutdown on production networks. Bandwidth server is used to test throughput between two MikroTik routers. Disable it in production enironment. Router might have DNS cache enabled, that decreases resolving time for DNS requests from clients to remote servers. In case DNS cache is not required on your router or another router is used for such purposes, disable it. It is good practice to disable all unused interfaces on your router, in order to decrease unauthorised access to your router. x numbers of the unused interfaces. Some RouterBOARDs have LCD module for informational purpose, set pin or disable it. We strongly suggest to keep default firewall on. Here are few adjustment to make it more secure, make sure to apply the rules, when you understand what are they doing. Currently IPv6 package is disabled by default. Please enable package with care, as RouterOS will not create any default firewall rules for IPv6 at the moment. add chain=input action=accept protocol=icmpv6 comment="accept ICMPv6"
add chain=input action=accept protocol=udp port=33434-33534 comment="defconf: accept UDP traceroute"
add chain=input action=accept protocol=udp dst-port=546 src-address=fe80::/16 comment="accept DHCPv6-Client prefix delegation." Enabled IPv6 puts your clients available for public networks, set proper firewall to protect your customers. This page was last edited on 17 December 2018, at 17:52.